The Drive for Men’s Health Announces…. 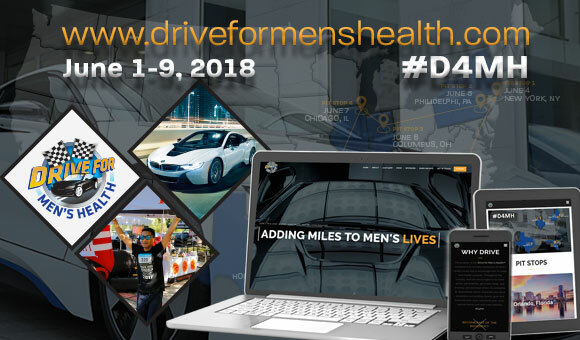 The Drive for Men’s Health announces dates for 2018 and launches new website. We even have a new car this year! During the 2018 Drive for Men’s Health, we turn our attention to the importance of how we feel about ourselves. Body image and body awareness are topics that many people are uncomfortable discussing, but these discussions are more important than ever. As we set out this June, we’ll address the ways in which we perceive our own health and wellness, and how we can help ourselves feel better inside and out. Since it was founded, the Drive for Men’s Health (D4MH) has reached millions of people with important messages surrounding men’s health issues – from the impact of fitness and nutrition to the importance of talking with your loved ones about sexual health issues that have traditionally been perceived as taboo. Beyond awareness, the D4MH raises funds in support of the latest research and development of best practices in urology care. Each year, the D4MH donates tens of thousands of dollars to help underwrite research, educational, and awareness-generating efforts in the fight to improve men’s health. The purpose of the Drive for Men’s Health™ marathon is to increase awareness of men’s health issues and to encourage men to make their health a priority. Throughout the country, men are encouraged to be more active, eat healthier, get better sleep, quit smoking, and decrease stress. As urologists, Dr. Brahmbhatt and Dr. Parekattil also drive awareness surrounding chronic groin and testicular pain, post-vasectomy pain, post-inguinal hernia pain and male infertility. To go along with our recently redesigned website, the D4MH is also sporting some new wheels this year! Come check us out along the way as we embark in the brand new BMW i8! Our clinic provides the most advanced, innovative, compassionate, and patient-centered care. We focus on patients with male infertility, vasectomy reversal, and chronic testicular and/or groin pain. © Copyright 2014-2018 PUR Clinic. All Rights Reserved.